Monobloc knives are the result of knives being crafted from a single block of steel. This steel block is usually an 18/8 or 18/10 chrome-nickel steel stainless-steel grades, although this block could also be 18/0 chrome steel (18 indicating the chromium content and 0 indicating the nickel content). The monobloc process means that the size of a block of steel directly impacts the size of the knife. A 20-centimetre block will therefore produce a knife 20 centimetres long. As these knives are forged from a single block, they often retain a simple, modern elegance simply not found in two-piece knives. The entire knife often contains the same beautiful shimmering surface if a mirror finish is used, or it can be coated with a coloured glaze or PVD coating. Monobloc knife design can take advantage of the existing simple metal template, producing a clean, highly minimalist look. Subtle curves might still make these kinds of knives unique. Alternatively, these knives can feature intricately carved patterns on their handles while still retaining their one-piece design. 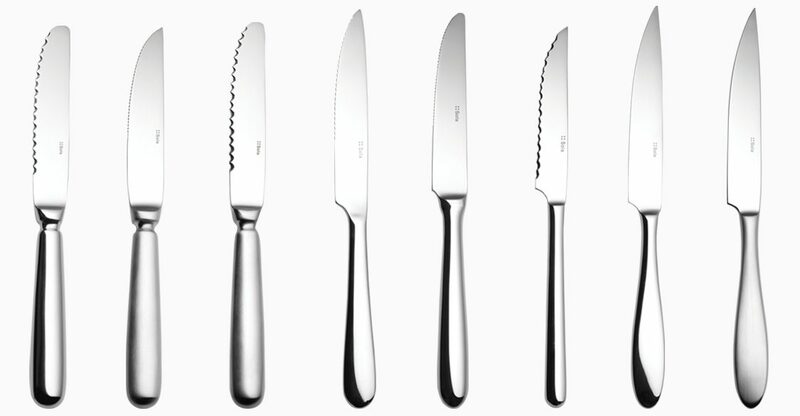 Monobloc knives are not simply aesthetically beautiful cutlery pieces, though. Forged knives are usually exquisitely balanced due to their one-piece design. Although forged monobloc knives may be weightier than their laser-cut or pressed or stamped siblings, the associated weight translates to a knife that will retain its quality for a lifetime. The blades of these knives retain their sharpness for longer, and they feel much more pleasing to grip in the hand. This can potentially pose a problem for individuals not used to holding weightier knives when they eat and may find it uncomfortable. This weight soon grows to be intuitive with use, however, so this should not dissuade those curious. The exquisite range of Sola cutlery available at JM Style features a wide range of monobloc knives in a number of different styles to suit different tastes. These knives are available in both forged and pressed forms, with minimalist and detailed designs available. The Sola monobloc knives are also available with a PVD coating, resulting in eye-catching matte blacks, coppers and golds. Browse the range at JM Style to find the perfect high-quality monobloc knives for your next big occasion. Established in 2013, we are proudly a house-hold name within the hospitality industry throughout Europe, known not only for our own brand but for the representing sought after manufacturers. We have been working together with hospitality manufacturers around the globe for over a decade. We offer decorating of fine glassware from world-known brands.